The controversy surrounding the construction of Gurdwara Gyan Godri seems to be coming to an end as Sikh organisations that had been demanding the construction of the gurdwara at Har-ki-Pauri have now agreed to its construction at Ranipur. Former Deputy Prime Minister of India LK Advani today reiterated that he had no desire to be the Prime Minister. The Congress today said the BJP stalwart LK Advani’s Jan Chetna Yatra has failed to evoke any response in Uttarakhand. The tall claims made by BJP Cabinet Minister Madan Kaushik of having a record crowd during veteran party leader LK Advani’s public address at the Rishikul ground fell flat as less-than-expected people were present at the venue. In what could be termed as a “show of strength”, a large number of people today attended the “bhanda fodh” rally organised by the Congress at BHEL here today. The rally was organised to “expose” the BJP in view of LK Advani’s rally in the city. The ongoing Jan Chetna Yatra of senior BJP leader LK Advani has provided the aspiring candidates of the forthcoming Assembly poll an opportunity to substantiate their claim for the ticket. District Education Officer (DEO), Nainital, Jeevan Singh Hyanki, has recommended departmental action against a Block Education Officer (BEO) for failing to turn up at a meeting convened by him. Three sheep died while 20 were taken ill after eating poisonous grass in the Forti area of Lohaghat subdivision, Champawat, last evening The chief veterinary surgeon, Dr TS Yadav, said: “The sheep belonged to Indra Singh of Dharchula, who has come to the Terai region as part of winter migration,” adding that 20 sheep that were taken ill were being treated and their condition was now out of danger. The citizens of the Lake City celebrated the birthday of their town by organising various events. The celebrations were held at the Government Girls Inter-College at the Tallital area of the town where blankets were distributed among the poor. Sweaters were also given away to a large number of needy students from various schools. 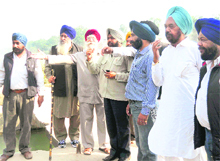 Under the aegis of the Uttarakhand Gurdwara Gyan Godri Sangharsh Samiti, representatives of various Sikh organisations yesterday visited the site earmarked by the Uttarakhand Government at Ranipur (Chandracharya chowk) adjacent to the Ganga canal. Gurdeep Singh Sohta, a member of the 20-point Programme of the Uttarakhand Government, said this was the best place for the construction of the gurdwara. However, as a major portion of the Ganga canal is being operated by UP in Haridwar, a Sikh delegation had recently met Uttar Pradesh Transport Minister Ram Achal Rajbhar to demand their approval so that the construction could start at the earliest. Daljit Singh Maan, chief of the samiti, expressed hope that both the Uttarakhand and Uttar Pradesh Governments would respect the sentiments of the Sikh community and complete the administrative procedures regarding the construction of the gurdwara at the earliest. Gurdwara Gyan Godri Parbandhak Committee chief Harjit Singh Duwa, Gol Gurdwara Parbandhak Committee chief Tek Singh Sandhu, Kulwant Singh Wirk and Nazar Singh Chima were also present on the occasion. had no desire to be the Prime Minister. In Haridwar on the 39th day of his nationwide Jan Chetna Yatra while addressing a rally at the Rishikul ground, Advani said contrary to the normal perception, he had no desire to be the Prime Minister as “the love of the people and party workers is sufficient for him as no post can match this affection”. Lashing out at the Congress-led UPA government at the Centre, the former national chief of the BJP warned the Congress of the anger of voters, recalling the post-emergency political scenario. “In 1977, Congress parliamentary seats had fallen to just 100 seats and in Uttar Pradesh, out of 85 seats, it got a big zero. Even Indira Gandhi lost from UP. Now, it seems the party is trying to follow the same this time, owing to large-scale corruption, scams, inflation, tyrant attitude of ministers”, said Advani. Urging common people to support the BJP in the upcoming election so that they could provide able governance and effective anti-corruption law, Advani lauded the governance of Uttarakhand Chief Minister Bhuwan Chandra Khanduri. He said the Lokayukta Act, enacted by the Uttarakhand government, had become a role model for other states and it reasserted the BJP’s commitment in making sure an effective Jan Lokpal Bill. 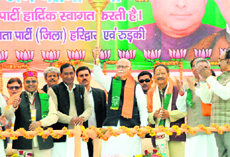 Accompanying Advani on the dais were Uttarakhand CM Khanduri, party general secretary Ravi Shankar Prasad, Uttarakhand election in charge Thawar Singh Gehlot, former Uttarakhand CMs Bhagat Singh Koshyari and Ramesh Pokhriyal Nishank, state party chief BS Chufal and a host of party leaders. Addressing a press conference in Dehradun, MLA Kishore Upadhyaya said empty stands at the Parade Ground rally of Advani’s Jan Chetna Yatra revealed that the much-publicised yatra had failed to evoke any response in Uttarakhand. He said despite misusing of the official machinery by the Uttarakhand BJP government, the rally failed to draw crowd. Upadhyaya even sought the details of the funds used by the BJP government to organise the Parade Ground rally. “The Uttarakhand BJP must give details of the money spent on the Uttarakhand leg of the yatra”, Kishore Upadhyaya argued. Upadhyaya also questioned the logic of the yatra in Uttarakhand when the state had been a witness to rampant corruption for almost five years now. “Advani did not utter a word about corruption committed by the BJP government of Uttarakhand, which is not proper”, the Congress leader said. Upadhyaya said it was also condemnable that Advani did not even find it appropriate to visit the State Agitation Martyrs Memorial in Dehradun. Former Uttarakhand Congress spokesman Surendra Kumar too criticised Jan Chetna Yatra, asserting that the yatra so far had failed to highlight corruption in the BJP-ruled states in the country. He also suggested that Advani should rather take renunciation from the politics as the age was no more on his side. What was more disappointing was the fact that enthusiasm and sloganeering that usually witnessed at any such rally was also missing. This despite the fact that the BJP is in power in Uttarakhand and all three Chief Ministers of the party were present on the dais. The presence of BJP national general secretary Ravi Shankar Prasad, state Cabinet Ministers and legislators could not draw the crowd in substantial numbers. State Urban Development Minister and Haridwar legislator Madan Kaushik, who was the convener of the Haridwar phase of Advani’s Jan Chetna Yatra, was seen quite worried about the crowd presence at the rally. Prior to Advani’s entourage entering the city area, he was seen directing district party office-bearers to make sure that extra vehicles were sent to nearby areas to bring in more people. When The Tribune questioned sub-convener of the rally Sushil Chauhan, who is also the Haridwar district party chief, he said the rally was successful with a sizeable number of party workers and no one was lured into the rally as was the norm adopted by other parties. “Though, we had expected more crowd, yet due to couple of rallies in Dehradun and Haridwar districts and passing of Advani on a bus stopped people from coming to the rally venue, but people thronged on both sides of the road throughout his cavalcade. 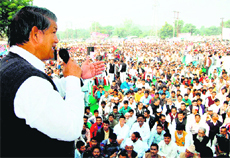 Doesn’t it prove the popularity of the veteran leader and the pro-BJP wave in Uttarakhand,” said Chauhan. A party leader even revealed that Advani’s daughter Pratibha Advani, who was busy filming the rally proceedings via a camcorder, enquired about the population of Haridwar, which could be easily related with the less number of crowd present at the venue. Even local people passing through the main road near the rally venue got surprised, when they came to knew that Advani was addressing the people as traffic was normal and ground was only just half-full. Addressing the rally, Union Minister of State for Agriculture and Food Processing Harish Rawat said though Advani had organised rath yatras five times, all these were “politically motivated”. He alleged that the BJP had also tried to gain political mileage from the Somnath-Ayodhya Ram Rath Yatra, the Jana Desh Yatra, the Swarna Jayanti Rath Yatra and the present Jan Chetna Yatra. “But people know the real face of the BJP as otherwise it would not have lost the 2004 elections. At that time also, Advani had carried out the Bharat Uday Yatra just a few months before the elections,” said Rawat. He also refuted the allegations levelled against the Congress by other parties that it was not in favour of the Jan Lokpal Bill. District women’s cell chief of the party Kiran Singh lashed out at the BJP high command for not taking any action against Madan Kaushik for his alleged role in the Mahakumbh scam. BJP leaders from various Assembly constituencies have gone overboard in bringing the maximum number of supporters for the yatra. In the process, they tried to discreetly pass on the message that with such a large crowd behind them, they have the required strength to contest the forthcoming poll. Apart from bringing supporters in large numbers, the aspiring candidates have also ensured that the entire route of the yatra is dotted with banners welcoming the senior leader while also making sure that their own picture and name are prominently highlighted. These banners also prominently display the name of the constituency which these leaders intend to represent in the next state Assembly poll. The fact that many leaders have gone overboard in their attempt to stake their claims can be gauged from the fact that banners of the sitting legislator from Nainital Kharak Singh Bora that were displayed at the venue of Advani’s public meeting in Haldwani already depicted him as the legislator from Kaladhungi constituency. Bora is staking claim from the Kaladhungi constituency as the party candidate since his own seat of Nainital has been declared reserved. Whether his status as Kaladhungi legislator on these banners has come about as an error or with a purpose is for the party leadership to guess. Even other leaders who are staking claim for various seats ensured that they bring the maximum number of people for the Jan Chetna Yatra. They had provided facility for the transportation. Reports appearing in the media have stated that these rival claimants from within the BJP have gone to the extent of spending lakhs of rupees just to propagate themselves at the event. The race for getting the party ticket to contest the forthcoming Assembly poll has already hot up in the BJP as the party leadership at the organisational level has been touring various constituencies to gauge the mood and choice of the party cadres. Various claimants have been staking their claims before the party leadership at the meetings held in areas being covered under the different Assembly segments. The action has been recommended against MP Singh of Kotabagh block as he had failed to turn up at an important meeting of department officials andprincipals of various schools. Hyanki has made it clear that officials who do not show seriousness for their work and fail to come for meetings despite having been informed well in time, would face stringent action. Speaking at the meeting held at Nainital yesterday, Hyanki ordered that the officials of the department must adhere to the norms laid down in the Right to Service Act 2011 and must dispose of the matters pertaining to the disbursements of scholarships and issuing of transfer certificates at the earliest. The BEOs present at the meeting were ordered to carry out surprise checks in various schools and evaluate the education being imparted to the students. They have been asked to submit regular reports at the District Education Office. The principals were also asked to provide information regarding the presence of teachers and their shortage through the BEOs. Various instructions with regards to the Mid-Day Meal (MDM) programme and infrastructural addition in school premises were also given at the meeting. He said cyanide toxins on grass that had been deposited owing to no rain in this area led to the death of the sheep. “These toxins are causing food poisoning. If the animal does not defecate after eating it, it can lead to its death,” said Dr Yadav. “A team of veterinary doctors and other staff has been deputed on the migration route of tribal shepherds,” he added. A large number of people had gathered to savor the delicacies and wish each other. Game shows and cultural events were also held apart from a prayer held by religious heads from various communities. The day is celebrated to mark the discovery of the town by a Britisher, Rosa P Barron, in 1939. So charmed was he by the place that he laid the foundation of the town at the place.